After careful consideration, we have made the difficult decision to close the Kitty Loft. As of January 1st, 2019, we will no longer offer boarding for cats. No new bookings will be taken for December 2018 — if you already have a booking, it will, of course, be honoured. To all our feline friends and their families, thank you for the patronage and support you have given us. We wish you well for the future. We have both indoor and outdoor kennels for canines. Your pet can enjoy the fresh air outside during the summertime and be warm inside during the winter months. Recently, we’ve upgraded all HVAC systems to provide quality air and heating systems so that your pet can have a comfortable stay. We offer individual rooms, some with perches and some with window seats. Your pet’s comfort is our number one priority. As a result, we do not use small cages. Our smallest rooms are 5 x 5 x 8. We also have two master suites for families with multiple cats. Our facility has six exercise parks that are filled with grass and trees for shade. Our 10-acre land is secured by chain link fencing. When you come to Hy Country Kennels & Pet Resort, your pets will be exercised at least four times a day at no extra cost to you. As for cats, they are visited and cuddled around twice a day. We guarantee a sanitary and healthy environment for your pet. We play music for all our kennels to provide your pet with a calming atmosphere. A separate building is available for small and older dogs. If your pet needs to be given medication, we will administer them carefully and as specified. We offer special rates to families who board more than one pet. Please contact us to learn more. Additional charges may apply for special needs (e.g. medications, supplements). Our rates apply to the time your pet(s) stay with us. There is a minimum one-day charge and half-day increments after that. For instance, if you drop off your pet(s) during our morning hours and pick your pet(s) up the next morning, you will be billed for one day. If you drop off your pet(s) during our afternoon hours and pick your pet(s) up the next morning, you will be billed for one day. If you drop off your pet(s) during our morning hours and pick your pet(s) up the next day during our afternoon hours, you will be billed for one-and one-half days. Our check- in and check-out hours are between 9AM-11AM and 4PM-6PM. Our daycare has been running for over 10 years. Drop off hours start at 8 AM. We have a group of “regulars” who stay with us between 3 to 5 days a week. Our daycare services consist of plenty of exercise, socializing and free time. Your pet’s daily schedule is dependent on the individual’s breed, personality, activity level, likes and dislikes. We require that all pets that come in be up to date with their vaccinations and be spayed/neutered. We have a limit of 12 dogs per day at our daycare. Your pet can enjoy a heated or cooled indoor room for lounging and can freely play in a 1-acre park outside, equipped with climbing tires and a playhouse. When it gets really hot in the summer, we bring out the wading pool and fire up the water cannon for your furry friends to play. We offer Daycare Discount Cards at our office. 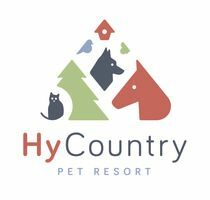 Hy Country Kennels & Pet Resort can take care of your furry friend in your absence.